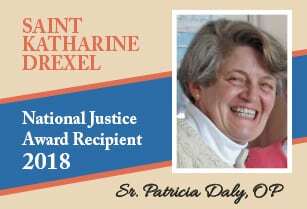 Guided by the spirit of Katharine Drexel, we are called to share the gospel message with the poor, especially among the Black and Native American peoples and to challenge all forms of racism as well as the other deeply rooted injustices in the world today. The love of our God is limitless. Just look at all of what He has created! 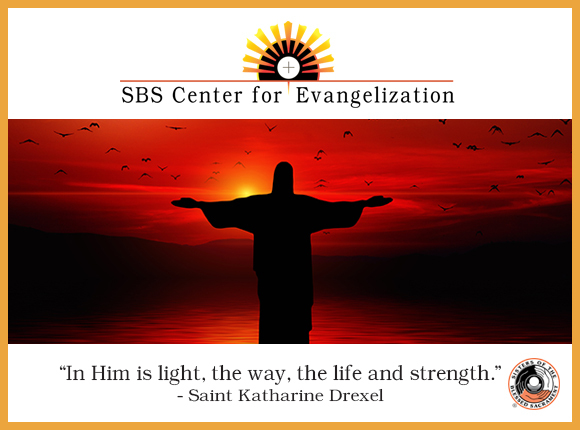 Sing praise that our risen Lord is among us…always! Wishing you and your family a blessed and happy Easter. 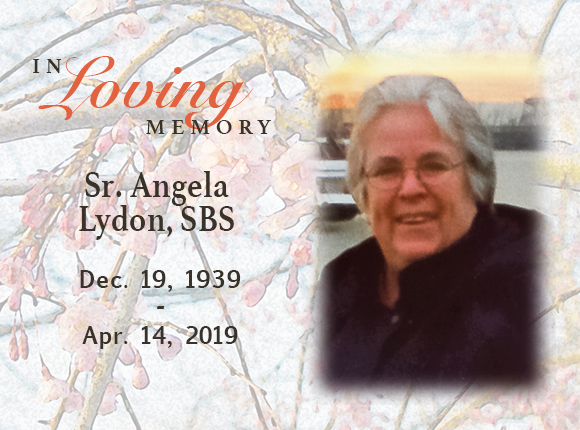 This announcement about Sr. Angela Lydon continues our tradition of memorializing our Sisters as each moves on to her eternal reward. 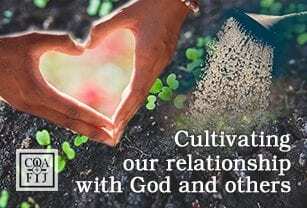 See the Monday blog posts and reflect on the upcoming Sunday’s readings as a way to enhance your faith journey. 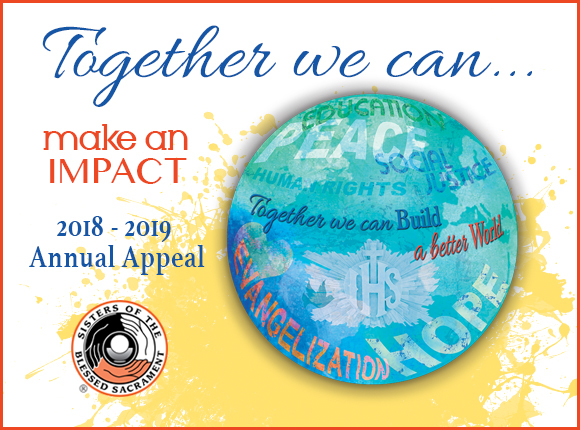 Our 2018- 2019 Annual Appeal is a joint effort to make an impact on the world in a positive way…something we can do together! 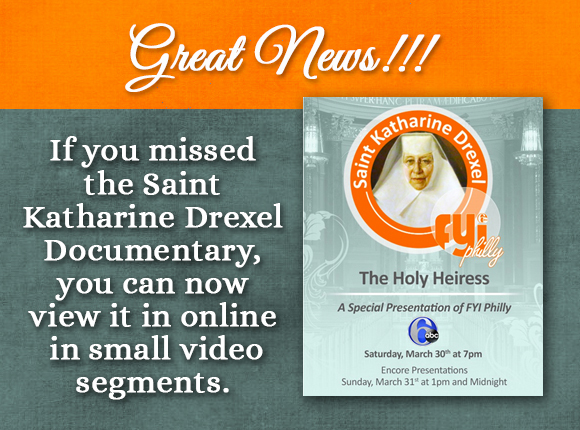 Now you can view this documentary on St. Katharine Drexel in 4 short segments online. Our consecration is a free and total gift of ourselves to GOD. The Eucharist, God's free and total gift to us, is the heart of our lives. Together we can unite against hatred, racism, and terrorism. Please join us in prayer for peace and world unity. Click below for our prayer page. The Sisters of the Blessed Sacrament stand in solidarity with Catholic Charities USA and Bishop Vásquez, Chairman of the U.S. Conference of Catholic Bishops’ Committee on Migration, who challenge us to take action against the recent policy of family separation at the border. 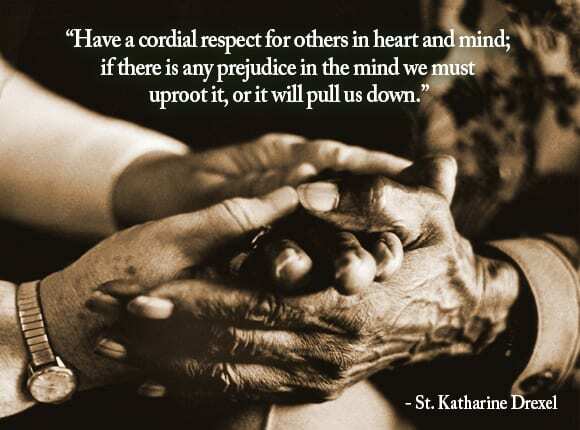 Click on this link below to see how you can unite with us as people of faith who wish to respond to this crucial social justice issue. 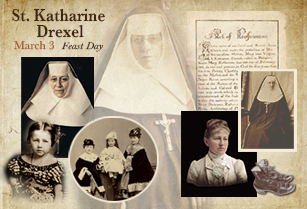 Follow along in the footsteps of a saint as you learn about St. Katharine Drexel’s family, her life, her ministry and canonization. For more information on the Feastday Novena, select Development from the pull down menu under the Partners tab. To read more about this year’s award recipient and view photos from the event, click below. 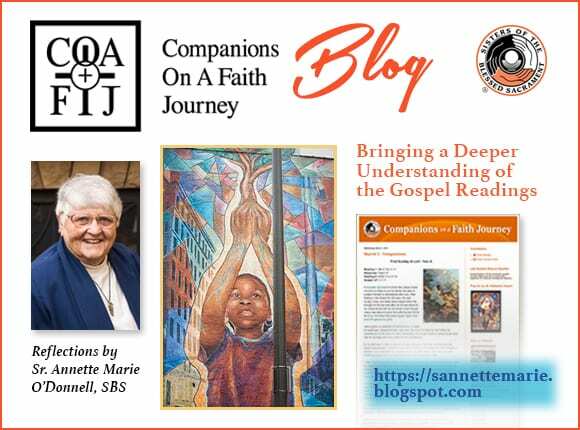 Companions on a Faith Journey features blog posts — reflections on each week’s readings from Sr. Annette Marie O’Donnell, SBS.